Bedouin in the occupied West Bank and in Israel's Negev desert say they fear for their future as new reports circulate that the Israeli authorities plan to relocate them. International aid and Bedouin groups say tens of thousands of people could ultimately be affected. Bedouin to the east of Jerusalem expect attempts will soon be made to move them against their will. They live in an area that is controlled by Israel's Civil Administration, part of the Defence Ministry that governs the West Bank. "Nobody can stop them. This is their project and they will implement it no matter what," says Ghadara Jahalin, who squats on a rug surrounded by her grandchildren in a camp made up of tents and metal shacks. "They will push us to somewhere where we won't be able to survive". The small community already endures harsh conditions in the desert. They have no running water or access to the electrical grid. On the other side of the busy road leading to Jericho, Israel's largest settlement, Maale Adumim, fills the horizon. "You can see now we are trapped between the settlements, their power cables and the road," Ghadara says. "We used to have wells, now we can't reach them. We can't plant anything so there is no pasture for the goats and sheep." The family moved here after they were forced away from Tel Arad in the northern Negev, more than 60 years ago, soon after the creation of Israel. Now there are plans to relocate them to allow for expansion of the nearby settlement bloc. The Israeli authorities say this will also give them better access to resources and services. Recently the Civil Administration declared its intention to move some 20 Bedouin communities, a total of about 2,300 people, most of them refugees. Reports said the Bedouin would be taken to a new permanent location by al-Azariya, close to a rubbish dump. Dozens of members of the Jahalin tribe were relocated there in the 1990s due to early construction at Maale Adumim but complain of lack of access to grazing land and health problems. The local UN agency, OCHA, says such a move would contravene international humanitarian law and "further endanger the Bedouin's way of life". However the Civil Administration spokesman suggested the plans were not final. He said work had gone on for months "to find a solution for the relocation dilemma of the Jahalin tribe who are illegally located without the required permit". "Talks are being conducted with the heads of the Jahalin tribe to find a solution that would suit them," he added. 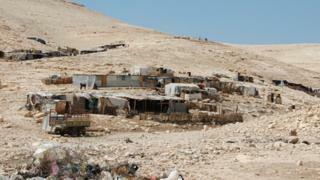 The Israeli authorities ban most new construction by Bedouin in the West Bank zone they control. Since the beginning of this year there have been increased demolitions of homes. UN data shows more than a hundred Bedouin structures have been demolished. Settler harassment is also a growing problem. In Khan al-Ahmar, many homes are under demolition order, as is the primary school, set up with the help of an Italian charity two years ago. It was built out of rubber tyres covered in mud and concrete. Dozens of children attend classes there. "All basic international laws support education. Today you must have it. It's as important as water and oxygen," says Eid Jahalin, the father of two pupils. "The status of the school is like an intensive care patient: we don't know if it will make it or not," he goes on. "We are facing many lawsuits." It is estimated that about 27,000 Bedouin living in the West Bank. They mostly live in areas that Israel declared as state land or on private land leased from Palestinians. Some have deeds showing they bought territory when Jordan was in control of the area between 1948 and 1967. Many of the nomadic communities settled there after leaving their ancestral land in the Negev desert. The Bedouin that remained became Israeli citizens but still have a tense relationship with the state. In September, the Israeli cabinet approved a plan that would see over 30,000 Bedouins moved from Negev villages which it views as "unrecognised", to land adjacent to existing urban centres. These are villages that often predate the State of Israel, are not officially recognised and therefore denied state support or services. "A decision must be made for the country and for the development of the Negev and its residents, Jews and Bedouin alike," said the prime minister, Benjamin Netanyahu. Legislation is soon expected to go before parliament after a three-month consultation period. Jewish citizens who live in the Naqab [Negev] are free to live in cities, a kibbutz, even their own farm. Why is this not the right of all citizens? Arab advocacy groups argue this reverses the usual planning process and that Negev Bedouin will never agree to relocate two-thirds of their population in "cramped towns" where they cannot pursue their traditional agricultural lifestyles. They say they seek rights to land that amounts to just 2% of the Negev. "We think the Prawer plan [named after Ehud Prawer, an Israeli official who led a team to resolve the issue of unrecognised villages] is bad for the Bedouin and Jews because it will upset Arab-Jewish relations," says Thabet Abu Ras of Adalah, the legal centre for Arab minority rights in Israel. He sees it is an act of discrimination against the Arab-Israeli community who he says are looked at as "a demographic and security threat". "They think they can push Arabs from the border, reduce the population and make room to establish more Jewish communities," he says. "Jewish citizens who live in the Naqab [Negev] are free to live in cities, a kibbutz, even their own farm. Why is this not the right of all citizens?" Large protests have already taken place and more are planned.